DL Services was formed in January of 2009 by Dave Lyons. 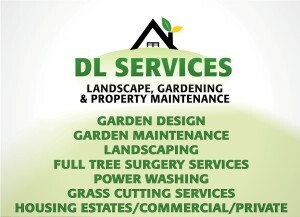 DL Services is an Irish owned, Cork based, Landscape and Outdoor Solutions Company, which offers a comprehensive range of services to both its domestic and commercial clients. During the growth of the business, Dave has developed his skills in the Design and Landscaping industry, undertaking a full time course in Horticulture in CSN Cork. Over the last 4 to 5 years DL Services as developed into a well-established company which provides design, layout, full landscaping construction, and maintenance services, as well as a host of ancillary services, in an effort to create the prefect outdoor living area for your commercial or domestic space. Whatever work we take on we always strive to meet and exceed our customer’s expectations. We do not sub contract any of our work. Don’t hesitate to visit our Services section of the site as well as the showcase of our Gallery. Be assured you will get the best service at a reasonable price. DL Services , has a full time horticulturist employed, is fully insured, is a member of the Royal Horticulture Society and is fully tax compliant. We offer a full range of landscape design & construction activities including, initial site clearance, top soiling, turfing, flagging and dry stone walling. Our service are:- Flagging - Site clearance and ground preparation - Land drains - Grass seeding and turfing - Planting shrubs, trees, and hedging. - Fencing - Retaining walls and dry stone walling - Earth moving - Reclamation. Careful and regular hedging, pruning and trimming of your garden is essential to its maintenance and includes roses, plants, shrubs, fruit trees and small trees. This service also includes the removal of small shrubs and trees. For large jobs DL Services have qualified tree surgeon who is very experienced in both commercial and domestic tree services. All services and prices quoted include the removal of all cuttings. Neatly trimmed and maintained hedges will only enhance the appearance and appeal of your property. DL Landscaping have experience in sourcing plants and trees for all your gardening needs. If you require a complete make over of your borders or just revamping areas of your garden, we can help. We can advise and supply any type of tree, hedge or shrubs for screening.